Once again, Lady Fortune has smiled down on me and blessed me with a fantastic book to read. S.D. 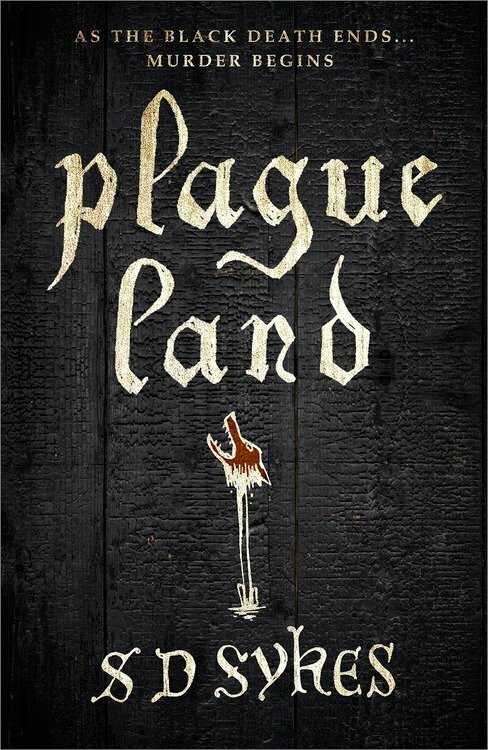 Sykes takes us to fourteenth century England in the last throes of the Black Death in Plague Land . Oswald de Lacy is back at his family manor after his father and two older brothers died of the pestilence leaving his mother and cantankerous sister, Clemence, behind with no one to run the estate. Oswald, once destined for the monastery, is eighteen and suddenly the lord of a large manor and the remaining superstitious and disgruntled villagers. Fortunately, he is not alone, a brother from his Benedictine house has accompanied him home to offer guidance. Unfortunately for Oswald, demanding peasants and a large plot of land are not his only problems: there has been a horrific murder and as Lord of Somershill, he must solve it before the murderer strikes again. In 2010, medical geneticists concluded that all forms of the Black Plague originated in China killing 25 million people before it reached Constantinople in 1347. How did it spread to Europe? As Sykes pointed out, there was a resurgence in trade with the East – the demand for exotic spices and precious silks brought Europeans into contact with plague rats that travelled along with the goods to the continent. Another popular, and somewhat gruesome theory on the first point of contact was in Crimea where the Mongol army catapulted infected corpses over the city walls. The Genoese traders fled and took the plague with them to Sicily where it broke out in October 1347. From there, it spread rapidly North where famine and unsanitary conditions created the perfect storm for a pandemic. By June 1348, the Black Death had finally made landfall in Merry Old England. Some scholars have recently challenged these common reasons for the occurence of the Black Death stating that it may have been a form of Anthrax combined with other pandemics. The idea is that the plague spread too rapidly and that in some colder northern climes, the fleas would not have been able to survive the temperatures. This leaves many questions unanswered as the research continues. Was there a possibility of recovery? In some cases, yes. The pneumonic version was where death was a surety. The bubonic form that most people are familiar with was curable, in some instances, if the buboes were discharged. Post plague, feudalism began to crumble as the remaining peasants sought higher wages and better positions. Labourers turned the tables on their lords knowing that landowners were in desperate need after their workers had been decimated by the outbreak. If you weren’t prepared to offer a decent wage, you could find your fields empty and your neighbours field full and tended with your former workforce. Religious fanaticism rose in the midst of the pestilence as people tried to understand why it happened. Certain groups were targeted, like Jews, outcasts and perceived sinners; superstitious beliefs sprouted unchecked like weeds. Men like Syke’s grasping priest John of Cornwall, were the type who tried to take advantage of the new world order by grabbing at positions they previously would not have been able to attain and feeding off rampant fear and superstition get ahead. Oswald’s struggles as a lord post plague were most certainly real and felt by many landowners in England at the time. Sykes does a good job of portraying Oswald’s difficulties with the villagers and managing his father’s estate. This is a medieval murder mystery with some plague and politics thrown in for good measure. What makes this book leap from interesting to amazing is Sykes’ writing. Once again, we have an author who can actually write, has done her research and created captivating characters and a solid storyline. What’s great about Sykes style of writing is that she manages to effortlessly insert humour into a book that is set in a miserable time and in the midst of a horrible situation. Oswald is a delight to read. He’s young and his missteps provide the comic relief in the novel. He bumbles his way through crime fighting and has no idea how to run a manor. Peter, his Benedictine brother, a kindly drunk but wise and loyal friend helps Oswald keep his land and saves his skin. Oswald’s high strung and overbearing mother, and his nasty and spiteful sister round out the trio and make fabulous characters that really stick with the reader. Other honourable mentions go to the local pompous village priest John of Cornwall, the evil knight Walter De Caburn, and waspish and defiant village whore, Joan of Bath. If you’re looking for a well written and engaging book set in the Middle Ages, or you happen to like thrillers, mysteries and “whodunnits”, then this is your cup of tea. Sykes has really reset the bar for medieval mysteries. Throughout the book, every clue brings with it unexpected twists and turns. When you think you know who the killer is, you’re slapped with yet another surprise. Just toss your theories out the window and get to the very end. Oddly, this wasn’t your typical fast paced thriller, it kept building at a slow burn yet remained an engrossing page turner. No character in this book ever fully fits a medieval stereotype: there are believers, non-believers, whores, knights, priests and village bumpkins but none of them are easy one dimensional personalities. Everyone has more than one side to their story; I really loved that about the novel. Sykes dismantled medieval stereotypes like the good knight and the honest priest, and showed the reader that the good guys aren’t always who you think they will be and the bad guys, more often than not, are the wolves in sheep’s clothing.